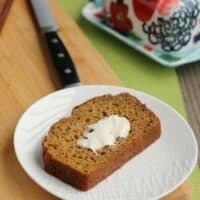 This healthy pumpkin bread is so moist and perfect, you’d never guess that it wasn’t 100% indulgent. Have you noticed I have a thing about making breads healthier? 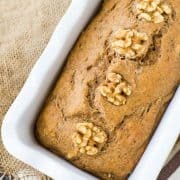 The main reason is that I love eating breads like this healthy pumpkin bread (or the chocolate banana bread I posted last week!) for breakfast. It’s still a treat in my mind but one that I can feel a little better about enjoying. What I love even more are recipes that make two loaves so that I can toss one in the freezer for a treat later in the month. One that is (or at least seems to be) work free to achieve. All you have to do is pull it out of the freezer and let it thaw. Another reason I like making breads like this more healthy is so that I can feel good about my daughter eating them. I feel confident that I am feeding her something that is not going to contribute to health problems later in life. Also, as you know, I’m not perfect when it comes to healthy eating (proof…and there’s more where that came from). Instead, I focus on everything in moderation and trying my best to make changes where I can. Whole wheat bread, whole wheat pasta, reducing the amount of butter, etc. Tasting this bread, you’d never know that it wasn’t completely indulgent. And that’s the best part. Besides the fact that it’s pummmmmpkin. This recipe uses a mix of whole wheat flour and all-purpose for a nutty, rich flavor but still a light, fluffy texture. Instead of oil, the bread gets plenty of moisture from a mix of the pumpkin, Greek yogurt, and water. It’s super easy to make and it makes two loaves – perfect for freezing one! 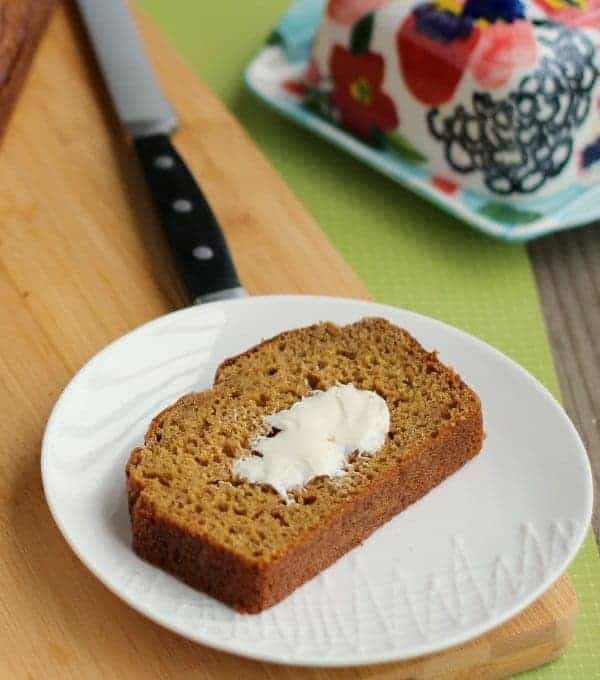 This healthy pumpkin bread is so moist and perfect, you'd never guess that it wasn't 100% indulgent. Preheat oven to 350°F. Spray two large loaf pans with nonstick baking spray. In a large bowl, combine pumpkin, eggs, sugar, yogurt, water and vanilla. Whisk until combined. In a medium bowl, combine remaining ingredients. Add these dry ingredients to the pumpkin mixture and stir until combined but do not over mix. Split the batter between the two loaf pans and bake for 1 hour to 1 hour and 15 minutes depending on the size of your loaf pans — mine are extra long so it only took an hour. A toothpick or a knife inserted in the middle should come out clean when the bread is done baking. Let cool 10-15 minutes in pans before removing to a wire rack to cool completely. You can easily cut the sugar in half in this recipe for an even healthier recipe. 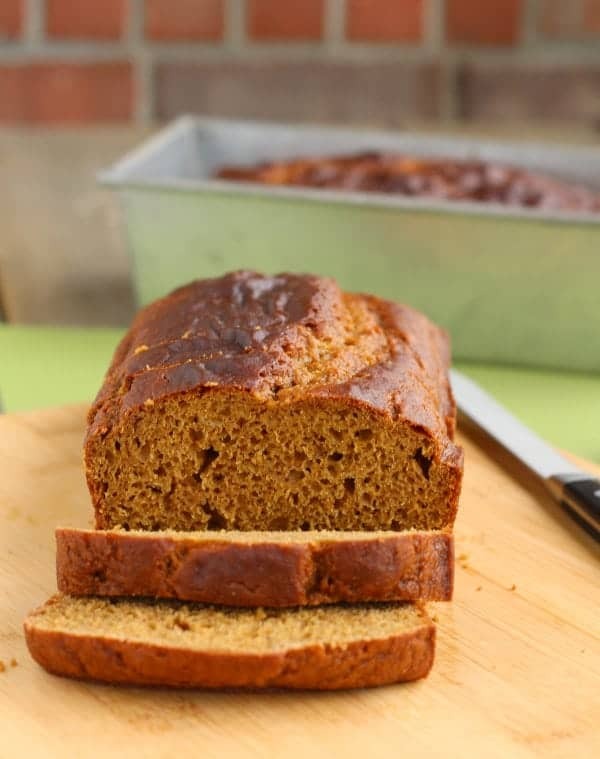 Verdict: Everyone loves this healthier pumpkin bread. Duh. some of the sugar with applesauce and molasses. We’ll see how it goes. I’ve made this recipe with less sugar and it has turned out great. I hope yours is wonderful too! Only have1/2 cup yogurt now & need to make for company. What can I substitute for the other 1/4 cup? this will intrigue those willing to experiment…. I loved the first batch SO much, I came back and made another … except I accidentally left out the sugar..(yikes! I thought… after I realized what I had done, it was already baking). Anyway, I had added 1/2 cup of raisins to the “wet” ingredients, which I blended in a blender. What do you know… Still turned out exceptional! my friends couldn’t believe it when I told them no oil OR sugar!!! what a great recipe! I made this recipe today!!! oh my goodness, did it turn out delicious!!! I’m a recipe modifier so here is what I changed and it turned out great: 1 cup of sugar, 1 1/2 tsp salt and 1 tbs pumpkin pie spice. I also changed 2 1/2 cups unbleached all-purpose flour and 1 cup whole wheat. I also added 1 tsp. almond extract. plus 1 cup of chocolate chips and 1 cups of walnuts. =) SO YUMMY and MOIST. I’m sharing with ALL my friends !!! Thank you ! Rachel,I love pumpkin! I have made this twice now and both times it turned out. :) Thank you,it is just so Yummy. Are you asking if you can cut the recipe in two and what to do with the three eggs? I would give it a try with just two eggs and see how it works. I haven’t tried it so I can’t be sure! Thanks for sharing this! To cut sugar way back, I used just 1 cup coconut sugar + 1tblsp molasses & optional sprinkling of Stevia, and omitted half of the water. Doubled spices + 2/3 cup chopped pecans. Terrific! What is the calorie count per serving? Thanks!! Delish! Hi Betsy — I don’t calculate this information (varies with brands, etc.) but there are many online nutrition calculators that you could use if you were interested. Hope you enjoy the bread! I would love to know if anyone cut the sugar in half. And if so, what do you put in place of that? I’m trying to cut back on sugar but I love my pumpkin bread! I’ve been wanting to try it with less sugar! Glad to hear it turned out well. Thanks for the comment! Happy Holidays! So glad you liked it! Love the changes you made. I want to try it with less sugar too. This pumpkin bread was delicious!! I highly recommend! 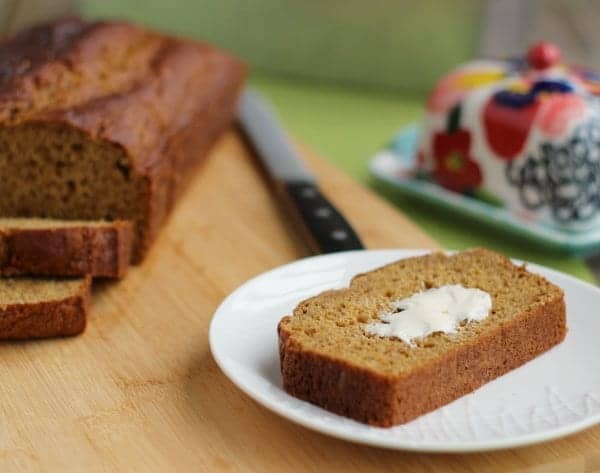 It’s hard to find a good recipe for healthy pumpkin bread and everyone loved this one- I think next time I am going to add a few more spices into it like nutmeg and cinnamon. 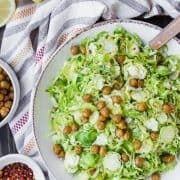 Maybe even sneak some chocolate chips in :) I recommend this yummy recipe and it will be featured in this year’s Eat Smart Move More Maintain don’t gain Holiday Challenge! So glad you liked it! The homemade pumpkin pie spice that I use has both nutmeg and cinnamon in it so that’s why I didn’t add those individually. I loved the recipe. I took it one healthy step further and replaced the eggs with 3/4 cup homemade applesauce. since the applesauce is naturally sweet I cut the sugar in half. I also added an extra 1/3 tsp baking powder to ensure it would still rise properly. Turned out great. Thanks for the delicious recipe. The cooking temperature must be in Celsius, not Fahrenheit? 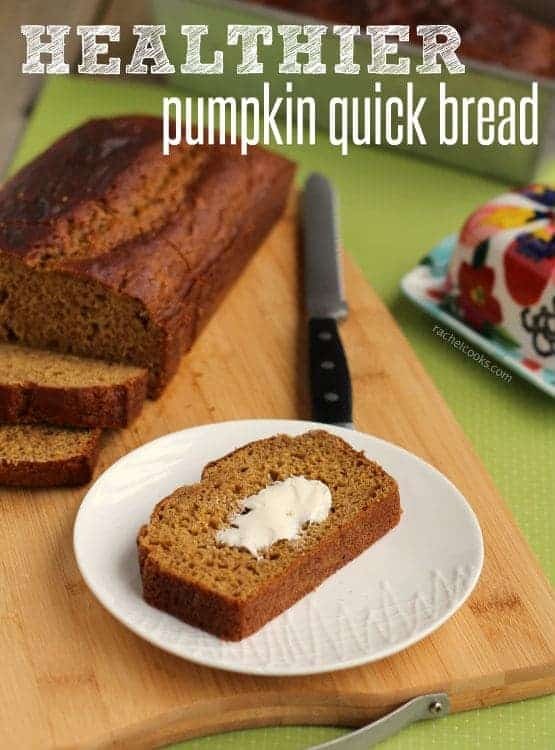 I’m going to try this one soon–I’ll add pumpkin to my grocery list! I am totally with you on this. I love quick breads for breakfast, but making a few healthy tweaks means that I can not feel weird about eating them right before I go to the gym! Haha. And normally? I find that swapping out some of the fat for a healthier alternative or some of the ap flour for whole wheat is barely noticeable at all! I’m definitely making this! Loving your healthier quick breads Rachel! I am all for healthy twists, and quick breads are the perfect place to do it! Love this one! On cool fall mornings I LOVE a big mug of coffee and a slice of warm bread….. Especially pumpkin! Can’t wait to try this. I could definitely get down on this loaf! I feel like pumpkin lends it so well to making a healthier baked good because it helps keep things moist. I bet this pumpkin bread is so good! 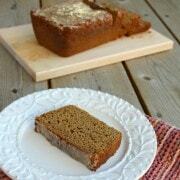 LOVE this – I love everything pumpkin and I’m always looking to try new pumpkin bread recipes. Looks yum, definitely will be trying this!